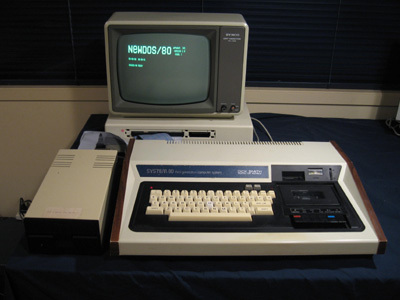 This site is dedicated to the System 80, a TRS-80 Model 1 clone, popular in Australia and New Zealand in the early 1980's. This computer also found favour in Europe as the Video Genie, and was sold (less successfully) as the PMC-80 in North America. It was also sold under other guises in other countries. Although in terms of software, the System 80 was a (near) TRS-80 Model 1 clone, it's appearance, interfaces and idiosyncrasies were unique enough to justify it's own place in the sun in terms of microcomputer history. This is particularly true in Australia and New Zealand, where supplies of TRS-80's were limited and cost 1.5x that of the locally distributed and supported System 80. Many an enthusiast cut their teeth on the latter, at a time when all other models were either very limited (e.g. the 1k ZX81) or highly expensive (e.g. the Apple 2). There is much which could be written about TRS-80 software and culture. Indeed, there are great sites (like this one and this one), which do just that. This site does not try to emulate them. Rather, these pages focus on the System 80 and its culture in Australia and New Zealand, largely from my own memory, the assistance of other contributors, System-80 literature and the pages of Micro-80. The hardware section is as factual as I can make it. The software and literature sections reflect purely personal experience (and taste). Over the years this site has grown and expanded and now contains a great deal of information not only about the System 80, but also its manifestations in other countries, EACA International and EACA computers generally. It also contains a growing downloadable disk image, cassette image and stringy floppy image archive, and some screen capture video. There is a YouTube video which takes a quick look at the model. Others have also added their stories. If you are looking for a particular manual or a specific resource, the Site Map might be worth a look. I'm always looking to further expand the site with yet more information so please e-mail me if you have any contributions, corrections and comments. If you want to keep abreast of updates, the best way is to follow my Twitter feed at @classiccomputNZ. For many of us, these computers have a special place in our memories. Often loved, sometimes loathed, these pages document their lives and times.